Large Hadron Collider Goes Back Online After 2-Year Hiatus : The Two-Way The giant particle accelerator at CERN, near Geneva, Switzerland, underwent a number of upgrades, including a doubling of the energy with which it can smash protons together. The Control Centre of the Large Hadron Collider (LHC) at the European Organisation for Nuclear Research (CERN) in Prevessin near Geneva. 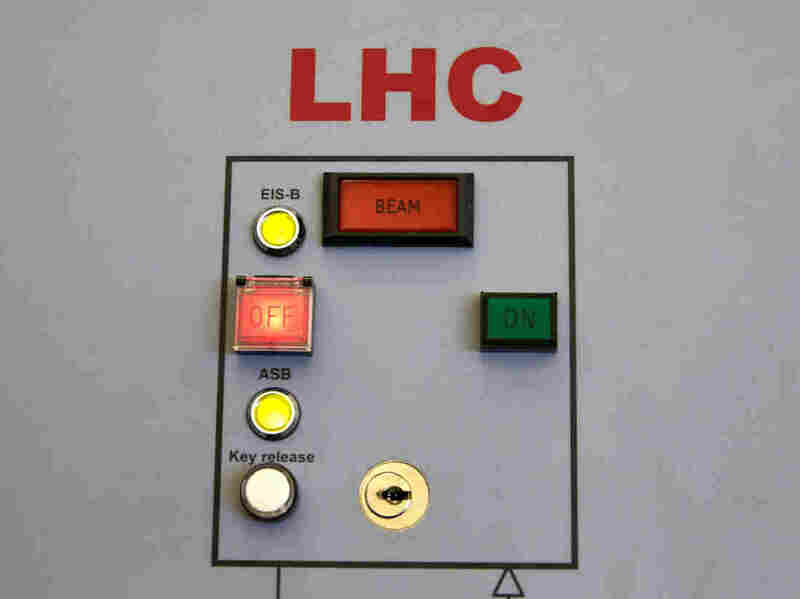 The LHC has been turned on for the first time after two years of upgrades. The Large Hadron Collider — the giant particle accelerator in Switzerland that confirmed the Higgs boson — is back online after two years and ready to ramp up to twice its previous proton-smashing energy. CERN, the European Organization for Nuclear Research, live blogged the restart here. The LHC was shut down to consolidate some 10,000 electrical interconnections between magnets, add protection systems, improve cryogenics, vacuums and electronics and boost the (proton) beam energy from 6.5 TeV (tera electron Volts) per beam to 13 TeV. "After two years of effort, the LHC is in great shape," CERN Director for Accelerators and Technology, Frédérick Bordry, says. "But the most important step is still to come when we increase the energy of the beams to new record levels." The increase to 13 TeV could start in early June, the lab says. The CERN Press Office says in a statement that: "The Brout-Englert-Higgs mechanism, dark matter, antimatter and quark-gluon plasma are all on the menu for LHC season 2. After the discovery of the Higgs boson in 2012 by the ATLAS and CMS collaborations, physicists will be putting the Standard Model of particle physics to its most stringent test yet, searching for new physics beyond this well-established theory describing particles and their interactions."